Private Tours in Normandy of Deauville & Trouville, Cabourg, Honfleur, Beuvron-en-Auge with exceptional guides. Departure Points: Paris. Other departure points available. 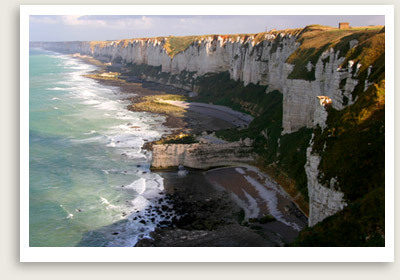 Picture Perfect Normandy Private Tour Includes: Private tour guide in Normandy, private transportation, taxes, tolls, parking. Your private tour of Normandy begins with a visit to the seaside resort Cabourg. You’ll be enchanted by Cabourg’s long sandy beach lined with striped umbrellas evoking the “Belle Epoque”. Author Marcel Proust was a frequent guest in the town’s Grand Hotel when it opened in the early 1900s. You’ll have a brief tour of the city center here. The next stop of your private tour in Normandy will be the charming port town of Honfleur. Located on the Seine estuary, Honfleur has inspired artists, writers and musicians for centuries – notably impressionist painters Eugène Boudin and Claude Monet. You will enjoy a short stroll around the old dock, where fishermen unload their fresh catches every day, and admiring the slate-covered houses of the old town. Your guide will also take you to see St. Catherine’s Church, covered in chestnut wood singles. The so-called “Axe masters” of the naval yards created the church without using any saws, in the fashion of their Norman ancestors. Next your Normandy tour will take you on a brief ride in the hilly countryside, dotted with horses, cows and apple trees, to reach Beuvron-en-Auge, a truly “picture perfect” village. Beuvron’s villagers take pride in keeping up their architectural heritage: multi-colored, half-timbered homes with window flower boxes. Your Normandy tour guide will take you to visit the 16th century Vieux Manoir in the village’s oval shaped square, and perhaps to stop for a glass of locally made calvados (apple brandy) while you’re here. The final stop of your Normandy tour is the twin seaside resort towns of Deauville and Trouville, separated by a river and connected by a short bridge you can go over on foot. You will stroll the boardwalk at Deauville’s beach on boardwalk, and time permitting, stop to see Trouville’s old fishing harbor.